Surprise! The book isn't over and Jace isn't dead, but he's certainly in a quite a predicament. Jace wakes up in a cell (one solid metal wall, three made of bars), and Baltrice is there ready to gloat. With the manablade now in her hands, she let's him know the bars of his cell were made with the knowledge they've gained from Church of the Incarnate Soul. The material's been altered to absorb mana. No mana. No spells. No planeswalking. No escape. Tezzeret enters, and it's made clear that he has plans in mind for Jace. Killing him would be too wasteful of that talent of his, yet he also does not take kindly to betrayal. And so Tezzeret just needs a few months before his solution to that criteria will go into effect. He's never been able to successfully create an artifact that can read minds, but he's certainly made strides in other areas. 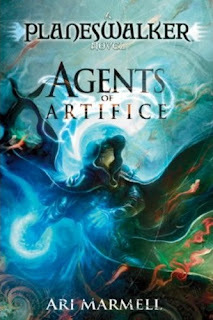 In a few months he'll have an artifact completed that will simply be used to control Jace. 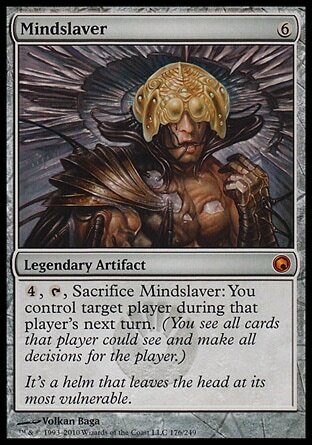 (Mindslaver anyone?) Jace will live, but forever be a slave within his own body. Tezzeret then let's him know that Baltrice has strict orders to not kill him, but she's free to anything else. And with that said, while she can't create a magical fire within the cell, heat and smoke easily penetrates. She surrounds the cell in fire and he screams. Everything is hopeless. There has been no chance for escape, and just countless hours of torture. And then Liliana appears. And here we'll cut to the chase, because we all know the results. He gets angry at her, she tells him the truth (mostly), he realizes he wants to believe she really wants to help him. She yells at him that life's been so easy for him because he can read minds, but she's had to struggle. He laughs that she can't be much older than him, and she reveals she's about a century older than that. She's made a pact with four separate demons, and payment is due. It's a fate she wants to avoid at all costs, and she tells him the plan was to use him to gain control of the Consortium, and use the Consortium's resources to find the answers to her problems. She tells him that she's gotten in good with Tezzeret, because the truth serum he gave her still didn't force her to tell the truth, and she really is here to free him. He asks why, and she says because she really does care for him... and... because they can still win. Maybe they can't take on Tezzeret, Baltrice, and all the guards all on their own, but they might not have to. They need to escape to Grixis. Tezzeret's fear of Nicol Bolas will not be strong enough to override the hate at the thought of Jace's escape. (Really? If you say so. There aren't many chapters left so I guess that just has to be true.) Once there, well... Nicol Bolas helped them once, he'll probably help them again. And finally, it all clicks for Jace. She doesn't want the Consortium for it's resources. She needs it as payment to the dragon. He knows what he has to do. First of all. I like the cell. Simple, yet effective. The revelation was obviously not a biggie. That was figured out several chapters ago, but of course it had to be said. Jace still needed to figure it out. But still I was excited by the final sentence. What's his plan? Now that he knows it all, how is he going to juggle Tezzeret, Nicol Bolas, and Liliana? Will he even help her? He does seem to semi trust her, perhaps that extends to him not wanting to see her die? Or does he simply want Tezzeret out of his life. Only a few chapters left, then end is coming!